Dion Beasley's Cheeky Dogs are featured on t-shirts. 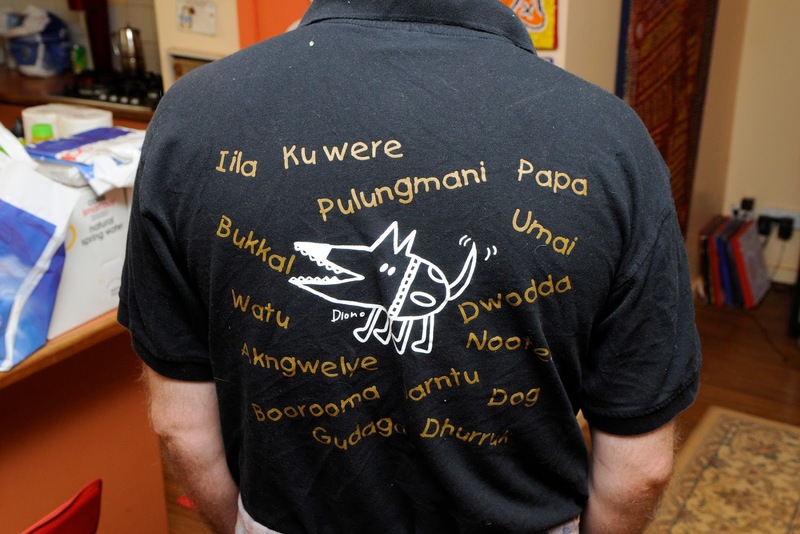 This one lists different Indigenous words for dog. Dion Beasley is an Indigenous artist best known for his drawings of Cheeky Dogs. So popular are his designs that they have spawned a company, www.cheekydogs.com.au. Dion is profoundly deaf and has reduced mobility due to muscular dystrophy. However, through his art, and with the support and collaboration of disability support educator Joie Boulter, Dion has found an outlet. Their story one inspirational story documented in Outback Spirit by Sue Williams. Joie spoke to SAT about Dion’s work. What is a Cheeky Dog? 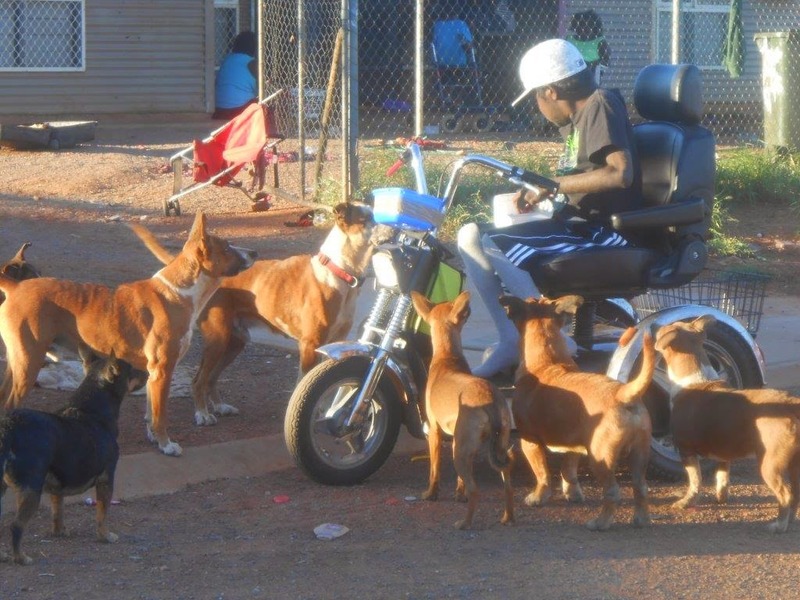 A Cheeky dog in an aboriginal community is one which has a tendency to bite or attack, while in other situations just means a fun-loving dog. How did you meet Dion? When Dion came to live in Tennant Creek, he attended the Tennant Creek Primary school (with his cousins) where I was teaching at the time. Soon after I went on long service Leave and so was able to spend more time with Dion, and this continued when I retired the following year. Can you tell us how Cheekydogs came about? 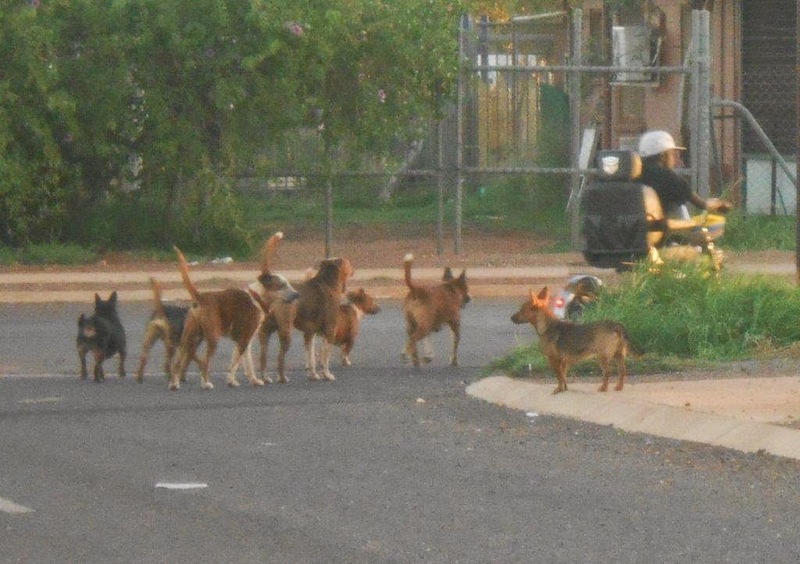 “Cheekydogs” (the Company) was formed in 2006,several years after Dion came to live in Tennant Creek with extended family. Dion was (at that stage) a very insecure little boy with extremely limited communication skills, but expressed daily experiences through his drawings. He particularly drew dogs which had a special quality about them. I believe that this special talent of Dion’s could be used to enable him to provide a vocation for himself, with the potential to provide a form of financial independence into the future(hopefully). This led to Dion’s drawings initially being transferred onto shirts and later onto a variety of products. At this stage my husband and I decided to form the Cheekydog Company as the avenue through which Dion’s art work could be used for his benefit. Dion greets some cheeky dogs. What makes Cheeky Dogs great subjects? Little did I realise at the time, how important dogs (and drawing) were to Dion’s wellbeing. Dion is absolutely fascinated by all the dogs he has encountered in all the communities he has lived in throughout his life. The dogs Dion draws are taken from real life and with his amazing memory he can recall all the dogs (and in which house they lived) he has met. His love for all dogs is evident by his excitement when travelling around communities. As well as drawing the dogs he also loves to photograph the dogs and so has many hundreds of photos of dogs of all sizes, shapes, colours and temperaments. Last week he attended the clinic (desexing) in Tennant. He was in seventh heaven, travelling with the workers, bringing back the dogs and watching the whole procedure! One of the workers showed Dion the procedure of collating the data on his I-Pad and Dion very quickly was picking up the idea. How does Dion come up with ideas for his drawings? Dion constantly talks about dogs and is self-motivated to draw subjects of his choosing. Often late at night Dion becomes absorbed in his drawings (he’s definitely a night owl) and is happy drawing into the small hours of the morning. Dion is also extremely knowledgeable about drawing aerial views of communities in which he has lived, so drawing communities with their many dogs is an exciting experience for Dion (and one which he regularly partakes in). How important is Dion’s work to him? I think that Dion’s drawing and love of community and associated dogs is essential to his emotional wellbeing. He becomes totally absorbed in his work and will not be distracted by any interruption. Dion is a very contented, creative soul when engaged in drawing, constructing or photographing. What more can I say about this wonderfully creative artist? He has a great sense of humour and delights in simple pleasures. Do you live with any dogs? We do not have a Cheeky dog here (a little selfish on my part, and no secure fence). 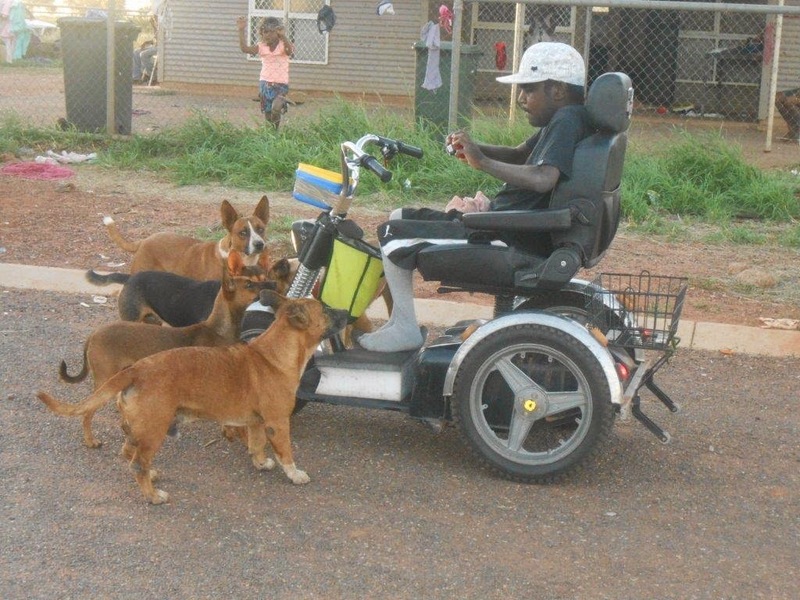 Dion travels down to his grandad’s house every day, taking a container of dog food which he happily feeds to the dogs at Mulga Camp .He really loves the Camp dogs but is not so keen on the well-bred varieties!! 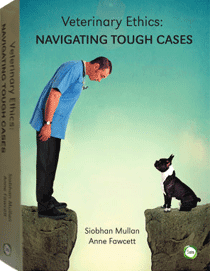 Do you have any advice for veterinarians or vets visiting communities for desexing programs? Sorry, no advice for those visiting communities but if Dion was able to join in the activities in the communities his day would be made! Thank you Joie and thank you Dion for your inspirational drawings. If you want to own an original Dion Beasley, whether its a t-shirt or artwork, visit here.